Check you have suitable lights and that they work. A white light on the front and a red one on the back both should conform to EC regulations. The bike should also have a rear reflector and 4 pedal reflectors. The lights must be on and working from sunset to sunrise when the bike is being ridden. Remember even if you as a cyclist can see other vehicles, they may not be able to see you and if you are in a collision at night with no, or poor lights you could be found to be at fault and or be given a fixed penalty notice. Cyclists are less visible to motorists at night and in bad weather. Check your bike is fit for purpose for example, your brakes, chain, that the tyres are firm and that your bell works. Wear an approved Cycle Safety Helmet (You do look cool honest!). Wear high visibility clothing. Be bright, highly visible colours are recommended for when you go out in daylight, whereas highly reflective materials should be worn in low light conditions. If you're cycling past a car that has just come to a halt, take caution when overtaking, as someone may be about to get out of the car. Cyclists should never cycle in the gutter as it gives no room for avoiding obstacles and leaves no room to fall if an accident occurs, increasing the risk of falling into the road and potentially under the wheels of a vehicle. Cyclists have as much right as drivers to take up the entire lane. However be respectful of other road users and always adhere to the highway code. A red light at a set of traffic lights still means stop! Signal well in advance and only manoeuvre when it’s safe to do so. Stop signalling when you turn. Check what is happening around you at all times. Look well ahead for obstructions such as: drains, potholes and parked vehicles, so that you do not have to swerve suddenly to avoid them. Give yourself as much opportunity to hear the traffic around you and avoid using headphones. Some large vehicles have ‘turning left’ warnings. If you need to overtake a large vehicle in a stationary queue, only do so on the right-hand side and when it is clear the vehicle won’t suddenly begin to move. Only overtake when there is no oncoming traffic and move ahead of the vehicle to ensure you are visible to the driver. Lorries have blind spots in front of the cab, on both sides and behind the vehicle. If you can’t see the mirrors, then they can’t see you. Training can improve your confidence when cycling on roads and can help you to position yourself correctly on the road and around other vehicles. Concentrate on your driving and do not use your mobile phone. Avoid loud noise in the car. Drivers or passengers often open their car doors without checking for cyclists. This can cause a serious injury if a cyclist runs into the door, and can even be fatal. Drivers and passengers should always check for cyclists, and be mindful of the fact they could be in your blind spot. Also think about the breadth of your door; it’s roughly 1-1.5m wide. If you open the car door with the hand furthest away from the door handle the body will twist and you will be in a more natural position to look and see what's coming from behind, before the door is opened. This maybe a good habit to try and get into. It is an offence under section 42 of the Road Traffic Act 1988, for any vehicle users to open "any door of any vehicle on a road so as to injure or endanger any person". If you're a driver involved in an incident with a cyclist, invariably it'll be the cyclist who will sustain the more serious injuries, considering the size of your vehicle in relation to theirs. Be alert to cyclists, understand that whilst you're surrounded by a metal cage, they rely on basic bike safety precautions like helmets and knee and elbow pads which, although are designed to reduce the damage upon impact and are strongly encouraged, will be little help in a high-speed collision. In fact, a good quality helmet is designed to withstand head-on impacts of no more than 13mph! However, cyclists who choose not to wear helmets are risking a serious head injury, as at least a helmet cushions any blow to the head caused by a fall or minor impact. 90% of cyclist casualties in recent years were caused by careless inattention, firstly by drivers, secondly by cyclists (nidirect.gov.uk). It’s your responsibility as a driver to avoid hitting the cyclist, not the responsibility of the cyclist to avoid getting hit by you. Pay attention and be on the lookout for cyclists at all times, especially when reversing. Use your mirrors as cyclists may overtake slow-moving traffic on either side. They may sometimes need to change direction suddenly, so be aware of this and observe any indications they give such as looking over their shoulder. Don’t tempt them into taking risks or endanger them. When overtaking a cyclist a driver is required to give them as much room as they would a car. Cyclists may need to swerve to avoid hazards. Drivers should always anticipate that there may be a pothole, oily, wet or icy patch or some other obstruction. Don’t drive too close behind a cyclist as you may not be able to stop in time if they come off their bike or pull up abruptly. 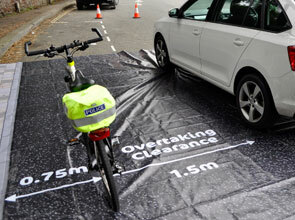 Give cyclists at least 1.5m clearance in slow moving traffic. At higher speeds or in bad weather a full car width clearance is recommended. Do not overtake near a junction, pedestrian crossing, on a roundabout or at pinch points. Never overtake just before a left turn you plan to make. Rule 66 of the Highway Code allows cyclists to ride side-by-side. It may come as a surprise to most drivers but cyclists have as much right as drivers to take up the entire lane. You will often see cyclists riding side-by-side, and you, as a driver, may think they’re being selfish by doing so. But the fact is the cyclist is actually reducing the risk of having an accident; it’s the safest way for them to cycle, particularly if there’s a blind bend, a narrowing of the road, a high risk junction, pinch point or traffic lights ahead. Cyclists should never cycle in the gutter as it gives no room for avoiding obstacles and leaves no room to fall if an accident occurs, increasing the risk of falling into the road and potentially under the wheels of a vehicle. Turning left is how most accidents occur. A cyclist may appear - perfectly legally - beside you while you’re waiting impatiently at a red light. It’s not at all illegal for cyclists to filter on the left or right of lanes but it is often difficult to spot them, especially when hidden by your blind spot. As you make a left, and as the cyclist intends to carry straight on, a collision may occur. Also be vigilant when pulling out of a side street, or car park. As a driver, beware of young children on bikes. Although most will ride on the pavement, and many will be under the supervision of an adult, some may be unstable on and unfamiliar with their bike and will not have accounted for any hazards that riding on the pavement may entail. This makes them more liable to swerve into the road without giving thought to the dangers that exist there. If you're passing a child, slow down, and watch them carefully as you pass them, whether they be riding on the pavement or the road. Groups of teenagers on bikes are becoming an increasing sight. Many may flaunt the basic road safety measures simply as a way of looking cool, nonchalant or carefree in front of their peers. They seldom wear helmets, and more often than not their bikes will not be equipped with lights in the dark. They may also ride erratically, either on or off the pavement. This makes them a serious worry for drivers, as their behaviour is often unpredictable. Be extra vigilant when driving near groups of cyclists of this nature.